VANCOUVER, British Columbia, Canada, April 10, 2015 (ENS) – The Marathassa, a Korean bulk grain carrier on its first voyage, is the source of the heavy bunker fuel oil that spilled into the waters of English Bay in Vancouver Wednesday, the Canadian Coast Guard confirmed today. The Marathassa arrived in the Port of Metro Vancouver on Monday, April 6 from South Korea. Sometime after 5 pm Wednesday, a sheen of oil was observed by boaters around the ship. The federal government notified the City of Vancouver of the spill at 6 am Thursday, more than 12 hours after the spill was first reported. 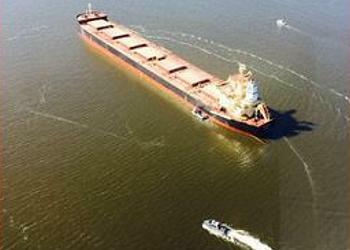 Officials from the Coast Guard and Transport Canada confirmed Thursday that the Marathassa is the source of the spill, estimated at a total 2,800 liters, which amounts to about 17 barrels. The toxic mess washed up on Vancouver’s popular Kitsilano beach. About 80 percent of that has been recovered by Western Canada Marine Response Corp. which set up a boom around the Marathassa late Wednesday night. The Western Canada Marine Response Corporation as directed by the Canadian Coast Guard will coordinate the shoreline cleanup and Vancouver City staff will assist as required, the mayor said. The federal agencies say shoreline cleanup efforts will involve crews in protective gear with special expertise in oil recovery and there is no need for volunteers. “CCG has all necessary Enviro Response equipment, 1000s of feet of oil booms and testing equip “at Vancouver’s doorstep,” Fisheries and Oceans tweeted Thursday. In a news conference Thursday afternoon, Roger Girouard, head of the Coast Guard’s Western Region, said two large patches of the spilled oil were spotted moving toward Vancouver’s North Shore and had been collected. There was “sheen material and some black tar balls” on the beach, he said. Girouard said the ship’s owners could face charges under Canada’s “polluter pays” principle, which holds vessel owners responsible for pollution in marine waters. Signs have been placed warning residents to avoid the beaches on both sides of English Bay as the cleanup operation continues. Clark said the province could do a better job if responsibility for oil spill cleanup were handed over from the federal to the provincial government. Federal Industry Minister James Moore hit back, saying it is wrong “for politicians to point fingers and make political jabs” before all the facts are known. 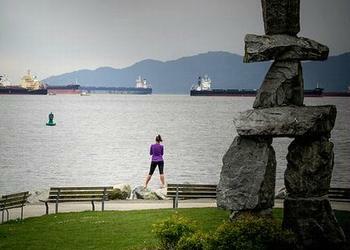 The Vancouver-based nonprofit David Suzuki Foundation, headed by the well-known scientist-broadcaster, is calling “the slow and confusing response” to an oil spill in English Bay in Vancouver nowhere near the “world class” response promised to Canadians by the federal government. The foundation says its spill scenario research shows how complex spill recovery can be, and that only a fraction of the oil spilled is ever recovered. “Our scenarios show that oil spills on the B.C. coast can be very difficult to deal with, and even with the best response only 15 per cent of the spill would likely be recovered,” Jay Ritchlin, David Suzuki Foundation spokesman said today. “In the past 24 hours the response from the Coast Guard, Port Metro Vancouver and other agencies hasn’t demonstrated that we have the world class oil spill response promised by the federal government,” he said. The Kitsilano Coast Guard base has been closed, so now the closest Coast Guard ship to English Bay is 30 minutes away in Richmond. The federal government has also closed three Canadian Coast Guard communications centers on the West Coast. “With plans for increased tanker traffic down our coast, the possibility of an oil spill occurring is very high,” Ritchlin warned.